Our product range includes a wide range of kids designer party wear, stylish kids party wear, kids party wear, girls party dresses and girls party wear frocks. 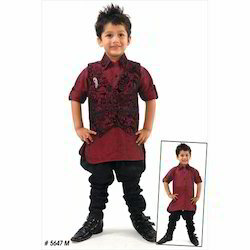 We offer an appealing range of carefully made Kids Designer Party Wear. These garments are designed and made using quality fabrics and advanced machinery. Our Party Wear are comfortable to wear and easy to wash. Young kids love the patterns of these dresses. 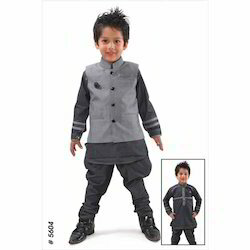 These kurtas are very high on Stylish Kids Party Wear and quality and so are in a great demand all over the country. Available in a wide array of designs and a plethora of color schemes, the stylish range of Kurta pyjama are designed to suit all special occasions. 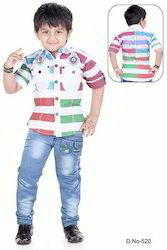 Our range of Kids Party Wear is made specially for Boys. These garments made for fun and play are shrink resistant. supply and trade one of the most exclusive quality materials in garments and dressing industry. Offered by us is a fabulous range of Kids Party Wear that provides excellent comfort to the wearer. These shorts are sourced from the leading vendors of the industry, who make use of finest quality fabric in tailoring the array. Besides, our efficient tailors offer excellent options on these shorts in terms of their sizes and colors, suitable to the clients. Looking for Kids Party Wear ?